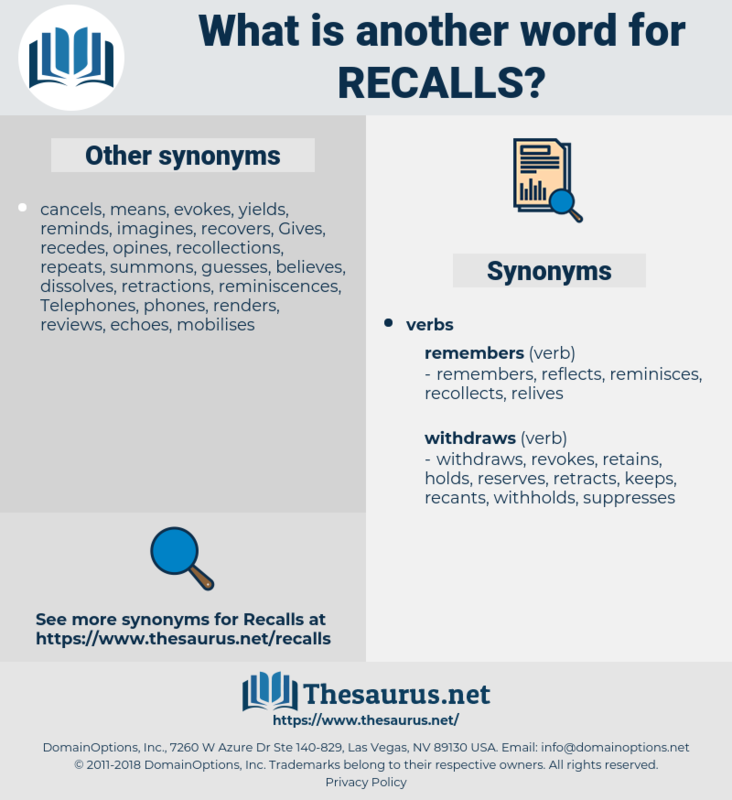 What is another word for Recalls? retrospective, reaffirms, recovers, Referring, restate, regain, restores, regains, indicate, refers, suggest, performance, Requiring, consultation, Consultations, cites, assembly, indicates, chavez, withdraws, suggests, clay, cambodia, committee, zimbabwe, signal, signals, says, withdrawal, withdrawals, court, summons, board, ling, tempest, reiterates, drops, state, Assad, show, shows, reminder, reminders, back, recover. 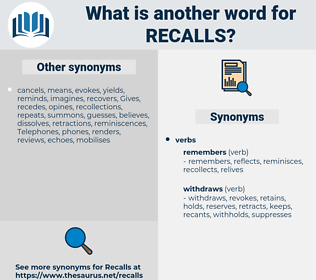 retrievals, recoveries, references, recognizes, recovered, removals, retreats, reinforces, retirements, retrieves, repayments, removed, terminations, withdrawn, callbacks, expresses, reports, instances, indications, stresses, returns, note, notes, deletions, cases, marks, bans, members, rrsps, boosters, Gestures, setbacks, payments, drawings, Cas, Ones, exits, opt-outs, states, OUTS, signs, BFS, reaffirms, recovers, amounts, runs, restores, refers, indicates, signals, withdrawal, withdrawals, reiterates, reminders. recollection, recovery, retrieval, call-up, encore. reclaims, recapitulates, declares, commemorates, relates, reaffirm, reflects, acknowledges, repeats, illustrates, recognises, incorporates, clarifies, reasserts, tells, revisits, reproduces, removes, restates, recounts, forgets, re-emphasizes, relegates, reconfirms, recommends, resembles, captures, explains, Records, describes, demonstrates, confirms, alleges, relies, renew, renews, collects, summarizes, explores, asserts, evacuates, anticipates, summarises, enumerates, encourages, introduces, alludes, emphasises, observes, considers, writes, emphasizes, identifies, creates, conjures, Addresses, represents, concludes, encloses, includes, Leaves, portrays, agrees, argues, underscores, Bears, remands, regards, instructs, depicts, stipulates, accepts, affirms, conveys, advises, resumes, falls, warns, feels, mentions, excels, references, underlines, requires, defers, knows, urges, forwards, necessitates, evokes, directs, highlights, lies, symbolizes, recognizes, pertains, covers, contains, determines, estimates, laughs, invokes, reinforces, connotes, specifies, triggers, echoes, contends, advocates, produces, Comes, remits, Rests, claims, request, requests, outlines, retrieves, speaks, believes, treats, transmits, examines, raises, is, belongs, defines, warrants, asks, provides, denotes, persists, adopts, lists, implies, signifies, clouds, becomes, demands, performs, sends, deals, maintains, presents, mirrors, entails, submits, Deems, holds, discusses, expresses, reports, brings, insists, sees, looks, talks, views, stresses, hopes, seeks, Focuses, returns, finds, hints, note, notes, puts, wishes, takes, marks, means, remembers, wants, gets, makes, states, Does, reaffirms, recovers, amounts, restores, regains, refers, cites, indicates, withdraws, suggests, signals, says, withdrawals, summons, reiterates, shows, reminders. No; that name recalls nobody to me. It was of a sort which recalls that soul - harrowing legend of the man hung up in an iron cage above a yawning precipice, from under whose madly shifting feet one plank after another is withdrawn from the cage's bottom, till no spot is left for him to stand on; and he falls. recycle, rozelle, regalia, rascally, roselle, raise hell, rehearsal, rescale, roccella, resell, reassail, recusal, rock wool, russula, rock oil, razzle, rigil, raucously, roughly, rascal, richelieu, regale, resile, rigel, rissole, rosilla, reseal, rachel, rockwell, rashly, resole, regosol, rorqual, rose oil, russell, rakishly, Rakehell, racial, recoil, roswell, roseola, rugulah, resale, regal, ruckle, richly.